Over the last few years, British filmmaker Jeanie Finlay forged a reputation for making fabulous films about stories from the fringes of the music industry. The Great Hip Hop Hoax told how a couple of Scottish lads got a record deal by posing as Californian hip hop artists, and Sound it Out profiled the last surviving vinyl shop in the northeast of England. As a teenager in 1960s Alabama, Jimmy Ellis’ wonderful singing voice was unlike any other. Except, that is, for one Elvis Presley. Hampered by his over-resemblance to the King, Jimmy’s own singing career floundered. 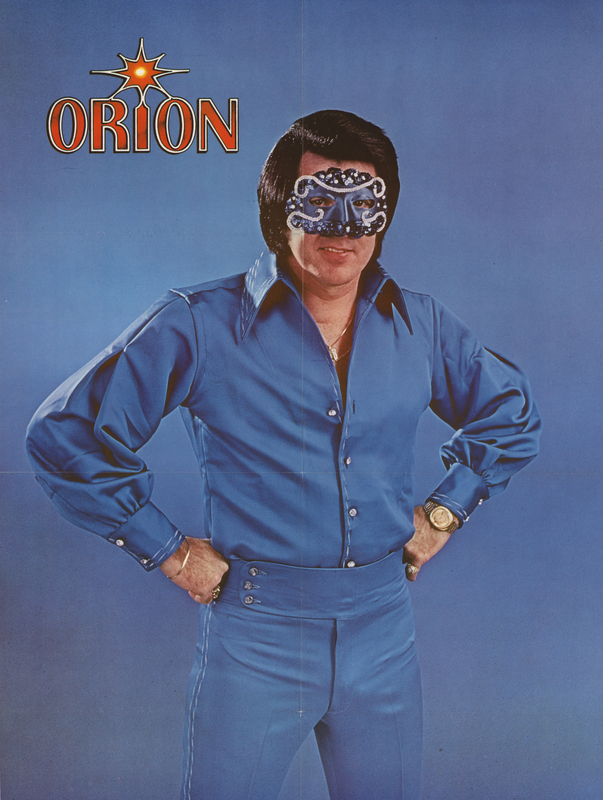 Then, in 1979 he found fame as a masked singer called “Orion”, a persona deliberately evolved to create intrigue in the wake of Presley’s death. Over the next years he played to legions of grieving Elvis fans, and developed his own fanatical fan base, many of whom remained in willful denial about the true identity of their idol. With his contract stipulating he never remove his mask in public, Ellis’ success came at a high price for the singer still hoping to succeed on his own terms. Jeanie Finlay’s nuanced portrait of Ellis serves as a riveting cautionary tale of the music industry, and a memorable exploration of identity. I discovered an Orion record at a car boot sale with my husband 12 years ago. And was just intrigued by this kooky masked man. We took it home and played it. It was confusing: what is this? Because it wasn’t Elvis songs but it sounded like Elvis and the mask was intriguing. And then we did some research and discovered Orion’s whole story. It was a total chance discovery. I wasn’t making films then; I was an artist. Cut forward six years and I’d made Teenland and Goth Cruise and I thought what am I going to make next? I’ll make Orion. But I couldn’t get anyone to fund it. So I got a bit of development money and I shot most of the film on that initial development. It seems like such a great story. Why was it so difficult to get funded? Part of it was timing. No one knew who I was. It is a guy who is not famous. The story takes quite a lot of explaining. It’s an easy story to dismiss as Americana. Some of the funders told me “We don’t fund Americana. This is Americana.” Also, six years ago, I was trying to make it pre Sugarman and pre 20 Feet From Stardom. At that time I did a panel for Sheffield Doc/Fest called “Just Don’t Call it a Music Doc”. Because I was told by a senior programmer “If you continue to make music oriented work, no one will fund you. You’ll get shown at festivals but only in a side bar, and you’ll never be taken seriously.” Obviously films like Amy, 20 Feet From Stardom, and Sugarman have changed that discussion. I was always convinced that it was a really great American tragedy. What kind of response are you getting from audiences, and particularly from Elvis fans to the film? It’s quite interesting trying to reach Elvis fans. We’ve been going through Elvis tribute artists because they have access to a whole community. But actually going to Elvis fans is tricky. Because they love Elvis, and they have their favourite Elvis Tribute Artists, but they don’t want anyone else. So they are really not interested in Orion. So we’ve been doing some targeted ads on Facebook, and we’ve had no end of abuse from Elvis fans who haven’t heard of Orion and think this is someone trying to pull a scam! Orion: The Man Who Would Be King, Monday, 16 November at 10pm on BBC Four.